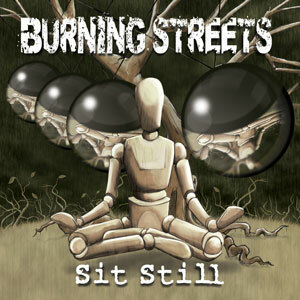 Boston band Burning Streets has a new release. “Sit Still” is out now on Sailor’s Grave Records and with it you get 11 tracks of emotionally charged rock and roll. On the whole, Sit Still hovers in the punk rock vein, but is heavily laced with a melancholy that accompanies other similar acts like The Loved Ones or American Steel and to a lesser degree, Dead to Me. The songs, averaging around the four minute mark, tend to be longer than what usually sits well with me. However the individual tracks have enough variety to maintain interest. The album is also well arranged, so the lengthy tracks aren’t as much a hindrance as they might otherwise be. Nearly all the tracks are of the emotive and moody variety. In the right frame of mind I can get into this more mellow side of punk rock. The album begins to gain momentum around track five, “The Safety”. After which the velocity appears to be too much and begins to lose control of itself as it careens into the oddly Black Crows gone glam rock sounding “Let Me Go”. Once the wreck is over “Sit Still” falls back into its more familiar, and frankly more enjoyable, paces. The disc winds down through a few more tracks and culminates into the feedback and tape hiss of its final track leaving you, I can only hope, feeling cathartic.